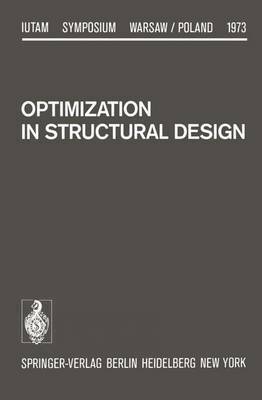 Structural optimization, a broad interdisciplinary field, requires skillful combining of mathematical and mechanical knowledge with engineering. It is both intellectually attractive and technologically rewarding. The Symposium on Optimization in Structural Design was the second IUTAM Symposium in Poland. Fifteen years have elapsed since the Symposium on Nonhomogeneity in Elasticity and Plasticity, presided by Professor Olszak, was held in Warsaw. These fifteen years mean a lot for mechanics in Poland. Continuing the tradition of Professor Maksymilian Tytus Huber's research, considerable development of the mechanical sciences has been achieved in this country mostly due to the knowledge, vision and persistence of Professors Wit old Nowacki and Waclaw Olszak, eminent Members of our Academy. The Institute of Fundamental Technological Research was established, competent research groups grew, matured and contri- buted to thermo-elasticity, plasticity, general theory of constitutive equations, and to structural mechanics-just to mention a few do- mains. Mechanics is now penetrating into the technology of this country at an accelerating pace. The optimization in mechanics has a tradition in Poland. In 1936 Professor Zbigniew Wasiutynski formulated the optimality criterion for mean stiffness design using an elastic energy concept. Further work in this field has been done since, mostly in the last ten years. On behalf of the Committee for Mechanics of the Polish Academy of Sciences I wish to thank the IUTA1V[ Bureau for the decision to hold in Warsaw the Symposium the present volume contains the contribu- tions to.